We’ve all suffered, it’s only natural to struggle to get back in to the swing of things – you’re on a high, you’re relaxed and then reality kicks in. It’s common to feel this way. Holiday’s are a lovely break from routine, however when you return to reality, it can feel disappointing. 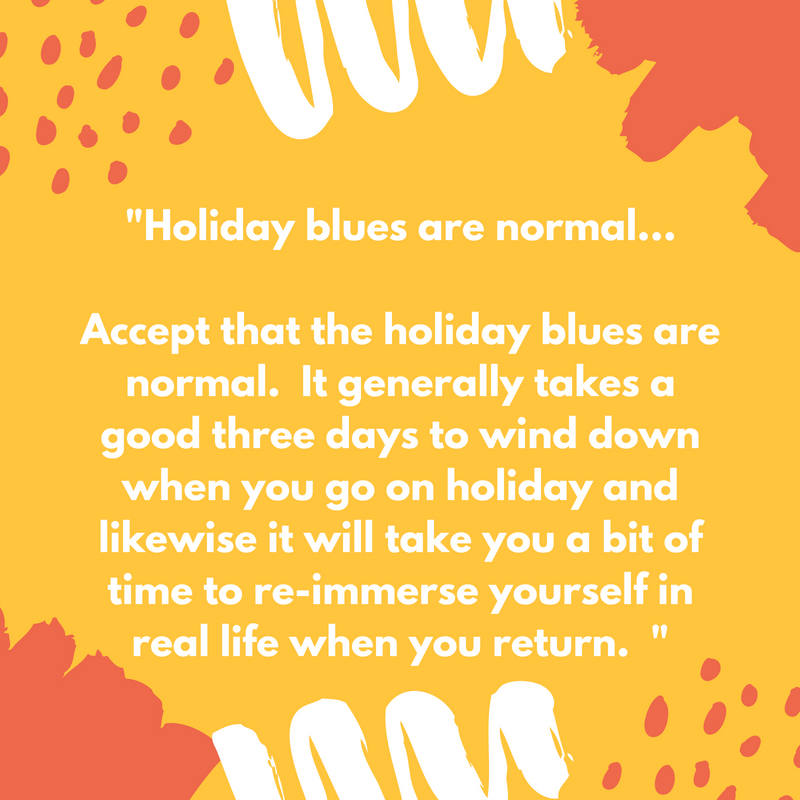 Accept that the holiday blues are normal. It generally takes a good three days to wind down when you go on holiday and likewise it will take you a bit of time to re-immerse yourself in real life when you return. Something that may work is that you schedule your return so that you head into work on a Friday. This way you have a day to deal with emails, the weekend to relax -knowing you’ve got a fresh start on Monday. Of water! When you’re on holiday most things will de-hydrate you; walking, alcohol and the heat. With all this to contend with, it’s likely you’ll return home with low hydration levels. Being dehydrated can leave you feeling tired with low energy. To help your body get back to normal when you return, try drinking at least two-three litres of water a day. After a relaxing holiday the last thing we feel like we should be doing is relaxing – the feeling of guilt springs to mind. How many of you feel guilty for taking the holiday in the first place? The usual thing when we return is to jump into an over-whelming to-do list – however this will leave you feeling even more tired than before! Try and factor in some relaxation time too, such as a reading a book, a soothing bath or time with friends. If you can find the time, a massage is the perfect way to relax while someone literally kneads, pummels and rubs the stress out of you. You will be surprised at how rejuvenated you feel afterwards! Daily routines can be pretty mundane, especially when you’ve just come back from holiday. Why not book things to look forward too? Breaking up the month with some nice things will keep you looking ahead. How about a meal with friends, trip to the cinema, drinks with your partner or a night away?